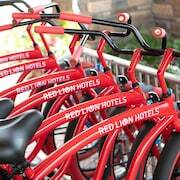 This smoke-free Red Lion hotel anchors the Kalispell Center Mall in downtown Kalispell. Situated on Main Street, the hotel is within walking distance of several boutiques, artists' studios, and galleries. Two ski resorts are within 30 miles. Glacier National Park is 35 miles away. A heated indoor pool and spa tub are housed in a solarium bordering the hotel's landscaped courtyard. The courtyard, with a meandering path and park benches, contains an outdoor spa tub. 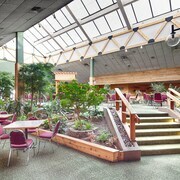 At the entrance to Kalispell Center Mall, the atrium-style Northwest Bounty Co. Across from the restaurant, the Magic Diamond Casino offers Keno and assorted video-gambling games. An on-site fitness room contains cardio machines and free weights. This downtown hotel anchors the Kalispell Center Mall, within a mile of numerous boutiques and galleries; Flathead Lake is 10 miles away, Whitefish Ski Resort is within 30 miles, and Glacier National Park is 25 miles. A solarium with pool and spa tub overlooks a landscaped courtyard. A fitness room and a small casino are also on site. Airport shuttle service and hot-and-cold buffet breakfast are complimentary. 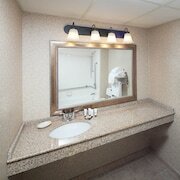 Guestrooms, all non-smoking, feature pillowtop mattresses, cable TV, and complimentary wireless Internet access. Decor includes wood furnishings and artworks of local landscapes. 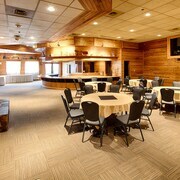 Red Lion Hotel Kalispell offers 170 air-conditioned accommodations with hair dryers and irons/ironing boards. Pillowtop beds feature premium bedding. Flat-screen televisions come with premium cable channels. Bathrooms include shower/tub combinations and complimentary toiletries. Guests can surf the web using the complimentary wireless Internet access. Business-friendly amenities include desks and phones. Housekeeping is provided daily. The hotel provides a complimentary full breakfast daily.